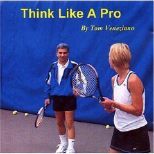 Tennis Server - Tennis Warrior - Success with risk, or security with safety? Success with risk, or security with safety? In doubles drills I teach players to advance to the net and position themselves approximately halfway between the net and service line. From this position they are in excellent striking distance when they receive a high short ball, and when they volley they are closer to their opponents which shortens their reaction time. 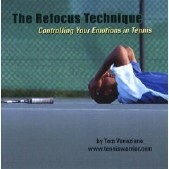 There is a positive mental attitude connected with playing aggressive offensive tennis. Sounds spectacular, doesn't it? So what's the problem? The problem is, they are put at risk for a lob over their heads. And with any risk comes the much-maligned, the most terrifying and the much-feared... FAILURE! They are now vulnerable to balls that land at their feet. They present their opponents with an opportunity for more reaction time. They are not in a position to hit winners when the opportunity arises. So they still fail, but safety is so alluring that they prefer security to success. The interesting paradox is that players may fail many more times playing incorrectly, but failing is irrelevant since they feel so wonderfully secure! And they do not even realize they are doing anything wrong. But if just one time they move up closer to the net and fail... It is the end of the world as they know it! The player whines, "This is horrible, this can't be correct, nothing is working, lobs are constantly going over my head, my pro must have lost his mind!" Bottom line - Players are more comfortable failing as long as they are in their comfort zone. They have three separate scenarios to choose from: 1) Do the right thing; 2) Do the wrong thing; or 3) Stay in the comfort zone. For most players right or wrong is irrelevant - the only priority is to stay in their happy comfortable zone of security. This is a huge problem because inside a player's comfort zone, wrong becomes right. And, believe me, players will fight a coach tooth and nail to hold on to a wrong that is within their comfort zone. This is the main reason why learning something new is so difficult. It is my opinion that Andy Roddick is struggling to come out of his comfort zone and venture to the net more often, especially behind his booming serve. Remember, pros are human too. They do not like to venture outside of their comfort zone any more than you do. Many pros will rally from the baseline, putting their opponent in deep trouble with a well-placed laser groundstroke, and then stand there watching as the opponent hits a weak return. If only they had advanced to the net! They would have had an easy volley and created extra pressure on the opponent. With the exception of Roger Federer and a few other players, this strategy is outside of many pro's comfort zones. Thus they let many golden opportunities slip by. Move out of your comfort zone by closing in when venturing to the net in doubles (approximately halfway between the net and service line). Staying on the service line is a band-aid solution until you learn how to advance to the net correctly. Move out of your comfort zone by not being so tentative when hitting your shots. You do not have to kill the ball, but let's start being positive and going for your shots (without tentativeness and cautiousness). Move out of your comfort zone by not letting high floaters bounce at the net. Close in on the ball and put it away... now! Make your pro happy... take a risk!